April 1, 2015, 11:47 a.m.
By Joseph Lichterman @ylichterman April 1, 2015, 11:47 a.m.
LONDON — The past few months have been full of change at The Economist. In January, Zanny Minton Beddoes was appointed the magazine’s new editor after her predecessor, John Micklethwait, left for Bloomberg. In November, The Economist launched Espresso, a daily news digest delivered via email or a dedicated app, which has been downloaded more than 600,000 times. And it’s been reported that the magazine is looking at expanding into China and India to reach new readers. The Financial Times reported that The Economist’s paid circulation fell last year for the first time in at least 15 years — but the magazine’s digital and print circulation is still 1.5 million, a 64 percent increase over the past decade. With these developments in mind, I spoke with Economist deputy editor Tom Standage, who oversees the magazine’s digital efforts, at his office at the newspaper’s London headquarters. Here’s a condensed and lightly edited transcript of our discussion, covering everything from The Economist’s digital efforts to the state of online media in general. Joseph Lichterman: It seems like it’s been a busy few months for you at The Economist, especially with the launch of Espresso. How does that fit into how you’re thinking about digital? Tom Standage: There are a number of big trends at the moment. The starting point is that we do see digital as an opportunity — because what we do, what our mission is, does not depend on the medium with which you deliver it. And I know everyone says that, but in our case it really is true, because what we actually sell is what I like to call the feeling of being informed when you get to the very end. So we sell the antidote to information overload — we sell a finite, finishable, very tightly curated bundle of content. And we did that initially as a weekly print product. Then it turns out you can take that same content and deliver it through an app. The “you’ve got to the end and now you’ve got permission to go do something else” is something you never get. You can never finish the Internet, you can never finish Twitter, and you can never really finish The New York Times, to be honest. So at its heart is that we have this very high density of information, and the promise we make to the reader is that if you trust us to filter and distill the news, and if you give us an hour and a half of your time — which is roughly how long people spend reading The Economist each week — then we’ll tell you what matters in the world and what’s going on. And if you only read one thing, we want to be the desert-island magazine. And our readers, that’s what they say. So that’s the starting point. The word “print” and the word “digital” don’t appear in there. This is a model that works in print and you can apply it to digital. And it is working — this is a product that does just as well in a digital world. Another aspect of it is — and I get all the morning briefings, Sentences, the FT one, and Quartz’s, and the rest of them — is that we don’t do links. The reason that we don’t do links, again, if you want to get links you can get them from other people. You can go on Twitter and get as many as you like. But the idea was everything that you need to know is distilled into this thing that you can get to the end of, and you can get to the end of it without worrying that you should’ve clicked on those links in case there was something interesting. So we’ve clicked on the links already and we’ve decided what’s interesting, and we’ve put it in Espresso. That’s the same that we do in the weekly as well — we’re not big on linking out. And it’s not because we’re luddites, or not because we don’t want to send traffic to other people. It’s that we don’t want to undermine the reassuring impression that if you want to understand Subject X, here’s an Economist article on it — read it and that’s what you need to know. And it’s not covered in links that invite you to go elsewhere. We’ll link to background, and we’ll link to things like white papers or scientific papers and stuff like that. The idea of a 600-word science story that explains a paper is that you only need to read the 600-word science story — you don’t actually have to fight your way through the paper. There is a distillation going on there. That’s a big thing that we’re focusing on. How else can we apply the same values — which is the distillation and the finishability, the trend-spotting and the advocacy — how else can we apply them to new areas? So we have various things that are on the boil. As has been reported, we’re looking at foreign-language editions. It’s not quite editions, because we’re taking a slightly different approach to it. We haven’t said exactly what we’re doing there, but that’s very much something that digital distribution allows us to do. To do The Economist in Japanese every week would be very difficult to translate quickly, and then to print and distribute it would be very expensive. But suddenly to do a foreign language edition through an app is much more feasible. So that’s something we’re looking at. Another area I’m looking at in a big way is video, and what are the new models for video. There’s going to be an answer from us shortly as well. We’ve tried lots of different models over the years, and video is a particular challenge for us because there are lots of things about it that don’t line up with our brand terribly easily — just basic things like the anonymity and so on. And you can’t scan it like you can scan text quickly. We’ll have another stab at that with a new venture that’s on the way. Ultimately, I think what’s interesting about the current environment is that there is an awful amount of froth around. There are an awful lot of news organizations that are being funded with VC money, and the VCs have persuaded themselves that because the news organizations use software, they’re a bit like tech companies and can be valued like tech companies. I don’t think it’s true, and I think an awful lot of these companies seem to have business models that are dependent on advertising, and I don’t think it’s going to work. So I think there’s going to be a shakeout. In the meantime, it’s good for us and it’s bad for us. It’s good for us because there’s lots of interesting stuff being tried that venture money is funding — so there’s a lot of innovation going on. And that’s kind of interesting, because we can say: “Oh, that’s quite interesting what they’re doing — why don’t we try it?” It’s bad because we have to compete with those organizations — which basically have infinite money and aren’t required to make profits — for talent. Relatively speaking, we were able to steal talent from other news organizations for the past decade because we were profitable and they weren’t. With a few exceptions obviously — Bloomberg and such. Our relative health was good. Now we face these big very deep pocketed venture-backed rivals, so that makes it a bit harder for us. Essentially their model — a lot of seem to be reliant on “eventually we hope AOL or Yahoo will buy us, and then it’s their problem if we don’t make any money.” So they’re doing some really good journalism, but I think there’s a problem there. The two that are different, I think, are BuzzFeed and Vice, and that’s because they have a fundamentally different model. They’re really agencies with a news organization wrapped around them. Superficially, they look like news organizations, but they’re using the news organization to establish the credibility and the reach for the agency. I have no problem with that model — I think it’s a very good one, and I think we can learn from it. To me, they really are a new beast, and maybe that is the new model. But I think the old “Let’s build a website, we’ll put a lot of ads on it, and that will pay for the journalism” — I’m not sure that’s going to work. And I think the newspapers that are trying to switch to that model aren’t going to make it work either. The amazing thing about The Guardian poll is that it tells you what the turnout is, which tells you what the overall staff level is, and it’s 964 people. That’s a very, very, very large newsroom. If they think they’re going to fund that with online advertising, I think they’re wrong. They’re going to have to increase their revenues extraordinarily and that doesn’t seem to be happening. Obviously, The Guardian is a special case — they’ve got their sort of trust fund, and so victory for them is only losing £30 million per year. But even so, that looks like a very large number of people to support with a very tenuous business model. Anyway, we don’t need to go into the survival of The Guardian, but an awful lot of these questions come back to: What are they smoking? But I suppose I was quite surprised even with Quartz — and I like Quartz very much, but to launch a new news organization in 2012 with a business model that’s predicated on advertising, I raise my eyebrows, I suppose. The Information, meanwhile, subscription based, I can kind of see that, or Business Insider, has a premium and a paid tier. That makes sense. The phone rings. Standage picks it up. Standage: Hello? Yes…Where?…Okay…Okay, this isn’t a very good time. I’m in a meeting. Can you call me tomorrow, please? Well, can you send me an email? That’s the best thing. Okay, send me an email. Okay. Thank you. Bye. Standage hangs up the phone. Standage: So I get a lot of random calls because I’m digital editor, so I basically get IT companies trying to sell me stuff because they think I’m the digital person. Would I buy security software? No, I won’t. Go away. Anyway, I’m probably rambling now. Lichterman: No, that was all interesting. Standage: I just think we are in a bit of frothy period. There will be a shakeout, or there will be some brand new model that comes by. I don’t think the current model is sustainable. Lichterman: So looking at that environment then, how does The Economist fit in? Standage: The Economist has taken the view that advertising is nice, and we’ll certainly take money where we can get it, but we’re pretty much expecting it to go away. So we’re switching toward what we call thought leadership, which is we sell sponsorship of conferences, with white papers, with online advertising as well. But essentially it’s not straightforward display advertising. It allows advertisers to associate themselves with particular topic areas, or raise their profiles in particular areas. And it’s not native advertising either, because the crucial thing for me is that we’re not serving this out of our editorial CMS. For me, that’s the line that we won’t cross. When the ads are coming out of the same CMS as the editorial, which is one definition of native advertising — we won’t do that. So a majority of our revenue comes from subscriptions, and always has. The proportion of revenue that’s coming from subscriptions is going up, and will probably continue to go up. So I’m very very happy that that’s our business model, because I think that’s sustainable. People do seem willing to pay for our journalism, and our digital subscriber numbers are going up very nicely. I should add a caveat that unlike many publications, we’re not in the position of trying to drive people from print to digital subscriptions. What we’re trying to get people to do is pay for print if they want print, or digital if they want digital, or both if they want both. As we sometimes say, print is just another device. If you look at our digital-only numbers as proportion of our overall circulation, it doesn’t look very big, because those are only the digital-only numbers. The real important number is what proportion of the subscriber base is paying for digital in some form. Because many of them are paying for print as well. So we don’t have this print or digital split and it makes us look like we’re doing less well than we are. But I don’t mind if people think we’re doing less well than we are. Our rivals — I’m happy for them to remain ignorant about this. The main thing is that I’m very happy with our position, which is not dependent on advertising because I think that’s a sticky wicket to be on. But let the market decide. Lichterman: How do you break down that digital/print divide? Standage: You can’t really allocate it because a print subscription in the U.S. is $130. Digital is $130. You get both for $165. Let’s say you pay $165 and get both. How much are you paying for digital? It’s completely arbitrary. That’s our bundling model. So you could say, well, I’m only paying $35 for digital and I’m really paying all that money for print — or you could do it other way. This isn’t an either/or world. We can sell and do sell both. But the main thing is that our revenue mostly comes from our readers, and that’s I think the sustainable long-term model. The same is true of all the products we launch. Espresso is thrown in for existing subscribers. For them, it’s an incremental thing — they don’t have to pay extra for it. If you’re not an existing subscriber to The Economist, you have to pay for Espresso. It’s $3 per month. It’s doing well: We’ve had about 600,000 downloads. Weekly reach is about 200,000 readers, daily reach is about 120,000 readers. 175,000 weekly subscribers have enabled free access to Espresso. So in all of those ways, it’s good. It’s extra value for the weekly subscribers, but the point we’re saying to subscribers who are new to The Economist is that we expect you to pay for our journalism, and even very small amounts of it, like Espresso, justify the value. It’s up against lots of other products that are free. They’re free, but are they sustainable? We’ll find out. Whenever there’s a new social network, I’ll join it and go play on it. And I go: This is great, why does it look so good? And then you’ll realize that it’s because it’s got no ads. And you think this is great, but then you realize: How long will it be like this? The other thing about ads is that 41 percent of millennials are using ad block. My daughter has ad block and she goes around infecting every machine she gets to. She puts it on everything. Lichterman: If it wasn’t important for my job to look at ads, I certainly would use it too. Standage: There you go. It’s faster. But the other thing is that she lives in incognito mode. She’s a total nightmare for advertisers, because she’s not leaving any cookies and she’s not seeing any ads. There’s a whole generation of people growing up — and we used to think the cliche about teenagers was that they posted everything on MySpace or whichever social network they were using at the time, but they don’t care about privacy and in the future when they go to look for jobs, everyone will look them up and say, Oh, look at this! But actually, none of that is true. They are all fans of Snapchat, ad block, and incognito. That again makes the advertising model harder. And then at the same time, the advertisers are saying that we want to know that the advert we paid for is being seen and they’re pushing all these visibility standards — and rightly so I think. Now you can measure that stuff, and you should. And when you measure whether ads are being seen, they’re not — they’re being served to a web page below the fold. And then you’ve got prices going down with programmatic buying. All of this makes, I think, basing an entire business model on advertising more precarious. I have nothing against advertising as a source of revenue as part of the mix, but I’m kind of amazed that people are trying to do that. Lichterman: Are there things other news organizations are doing that you think might be more applicable to The Economist? Standage:There’s a very interesting thing going on with the FT paywall where they’re getting rid of the meter. And we’re not thinking of that, but it’s a good example of how I look at what they’re doing and ask: What would The Economist version of that be? So then I kind of map it out and look at this, this, and this. I compare it to what we’re doing now and ask: Do I like it more than what we’re doing now? No. But maybe something will change, and I know that that’s a stepping stone that we can step onto. 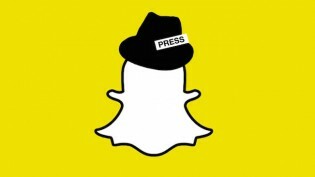 The other big trend that’s going on at the moment that’s very interesting, and that all news organizations have to deal with — and Snapchat Discover is the front and center example of it, but we’re seeing it with Facebook as well — is the idea that news organizations can hand over their content so it can be consumed on other platforms. The advantage, obviously, is reach, and maybe that model works if you have an advertising-based business model. I’m not sure it does — it just means you’re splitting the advertising revenue with someone else. Lichterman: And whether you’re going to be able to draw readers back to your own platform. Standage: Exactly. Maybe you don’t care — there’s the trend to get rid of your own website. NowThis is interesting. You must have seen the NowThis stuff. How are they making any money? There’s no ads and there’s no branding. They’re waiting for AOL to buy them, or Yahoo. They don’t mind — either will do. That model cannot work. Maybe I shouldn’t go as far as that, but the changes to the sponsorship rules that YouTube have made is that you can’t make that model work, I don’t think. Who knows? But the point is that move toward content that’s consumed entirely on platforms other than the one the media organization itself owns. Maybe you can do that, because that’s kind of the TV model — most TV production companies don’t own networks. But I think it’s another challenge, particularly to people who are ad-supported. The question for us — obviously we weren’t invited to participate in Snapchat Discover. But were we to, what would The Economist on Snapchat Discover look like? God knows — I mean, it’s not really our kind of thing — but for the sake of argument, let’s say it’s that kind of model. How would we monetize that? There’s an advertising slice of it, but we don’t want to be in a world where advertising is the main thing that’s paying our bills. The question for us is: Can we use that to raise awareness of the brand and have a halo effect elsewhere? You get the same with using Snapchat Stories or using Instagram. You can’t link out from these things. You can’t sell ads — you just have to use it as a general branding. Lichterman: Turning back to The Economist, it seems like an exciting time here, with a new editor, and that there’s a lot afoot these days. Has she impacted how you’re thinking about digital? Standage: Zanny has made it very clear that she wants to integrate digital output even more. We never had a separate editorial staff for digital, which I think was very good. For a while, we had a small team who were recruited internally who did some online stuff, but we then merged that back in. The line I’ve taken since I’ve been running things in that area is that we need to have the same staff writing for the web and for the weekly, because we want the same level of expertise and we don’t want somebody saying on the web that something is a good idea, and then have an article in print saying that no, it isn’t. Espresso is written by the same people as well. That’s very much part of our model. We never had this painful re-integration of the digital newsroom into the main one. But what Zanny has done is made some changes that have put digital much more centrally into the weekly planning process. We’ve all read about The New York Times changing to Dean’s List. The equivalent of that at The Economist is the Monday meeting where we kick leader ideas around. And Zanny has made “What do you do with that story in digital” and “We should have an explainer on that” absolutely part of that discussion now, and that’s great. I’m sure we have further to go, but it does feel like we are making a lot of progress in the area by making it clear to everyone that digital is not something that some people are expected to do — it’s something that everyone is expected to do. And increasingly they do. Lichterman: And people have been receptive to that? Standage: Yes. Zanny has made it clear that that’s what she wants to happen. In saying “Let’s have an explainer on that” or “Let’s have an audio piece on that, or an interactive on that,” she’s giving it equal billing in the Monday meeting with print pieces. That’s very important and makes people think about things in a different way. It’s not an optional extra. They are being evaluated on their performance on digital. Photo of President George H.W. 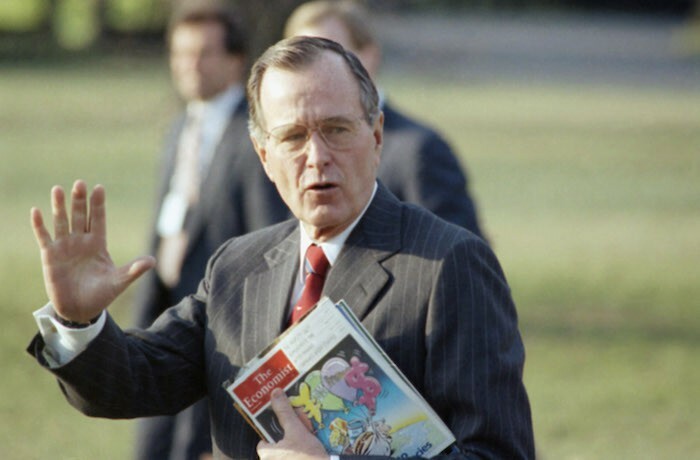 Bush carrying a copy of The Economist to the presidential helicopter in 1990 by AP/Bob Daugherty. POSTED April 1, 2015, 11:47 a.m.
Lichterman, Joseph. "The Economist’s Tom Standage on digital strategy and the limits of a model based on advertising." Nieman Journalism Lab. Nieman Foundation for Journalism at Harvard, 1 Apr. 2015. Web. 18 Apr. 2019. Lichterman, Joseph. "The Economist’s Tom Standage on digital strategy and the limits of a model based on advertising." Nieman Journalism Lab. Last modified April 1, 2015. Accessed April 18, 2019. https://www.niemanlab.org/2015/04/the-economists-tom-standage-on-digital-strategy-and-the-limits-of-a-model-based-on-advertising/.